If at first you don’t succeed, try, try again. That’s what my mother used to tell me when I was young (and I couldn’t help noticing that she then went on to have two further children). 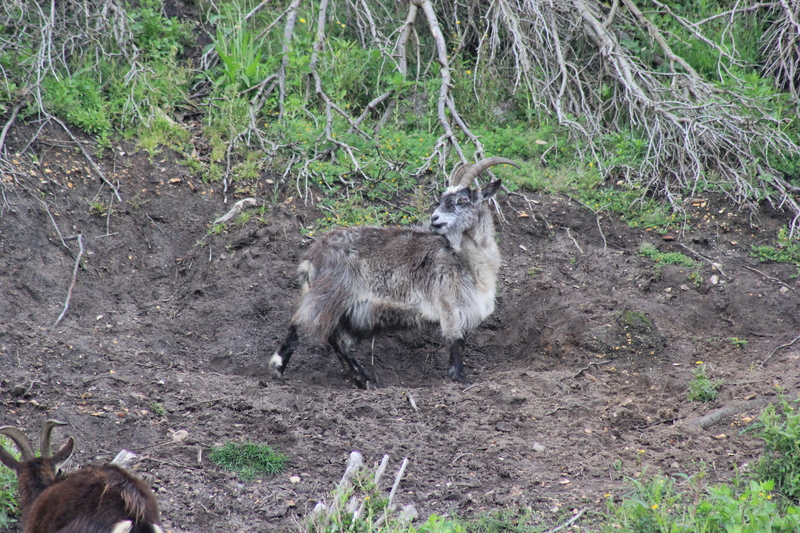 The reason I mention this is that at the end of our last walk I tried, and failed, to get a picture of a goat. Thus, instead of starting this walk at the exact point where we ended our last one, we decided to start back at the goats. Last time they were feeling shy. Not so today! They pranced around the cliffside with a frisk and a frolic for all to see. 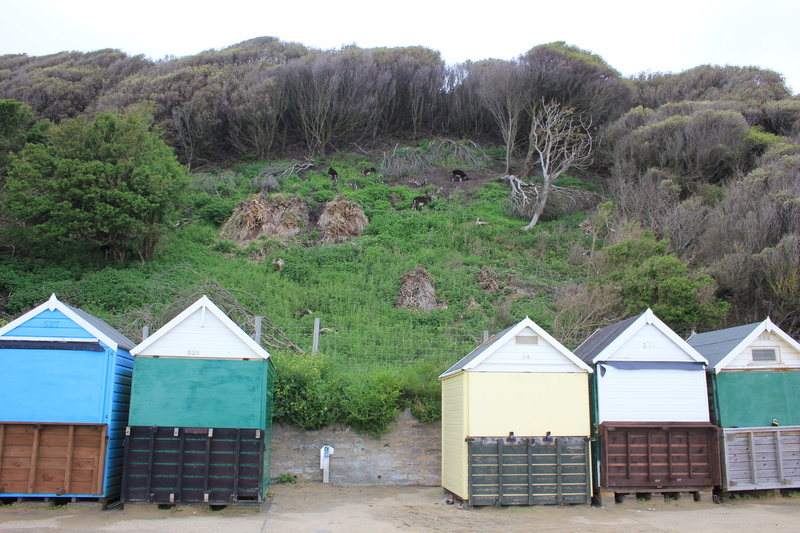 It is worth mentioning that the missing beach hut in this picture was not destroyed by a plummeting goat, but rather by the winter storms at the beginning of 2014. Cliffside goats do not fall. They stand proud. 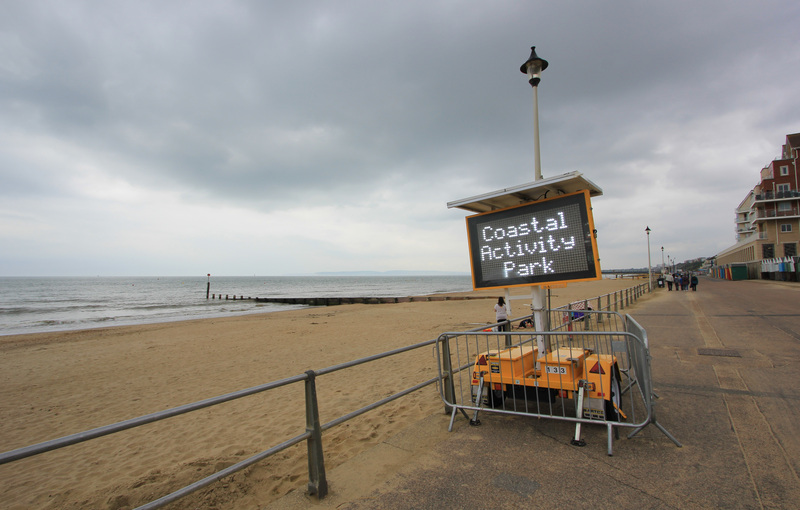 Bravo, goats of Boscombe! The people of Boscombe, however, were not standing very proud today. In fact they didn’t appear to be standing at all. I think they were all still in bed. Boascombe’s Coastal Inactivity Park was not very inspiring this morning and we quickly moved on. Further along the seafront, towards the pier, we found a bit more activity. 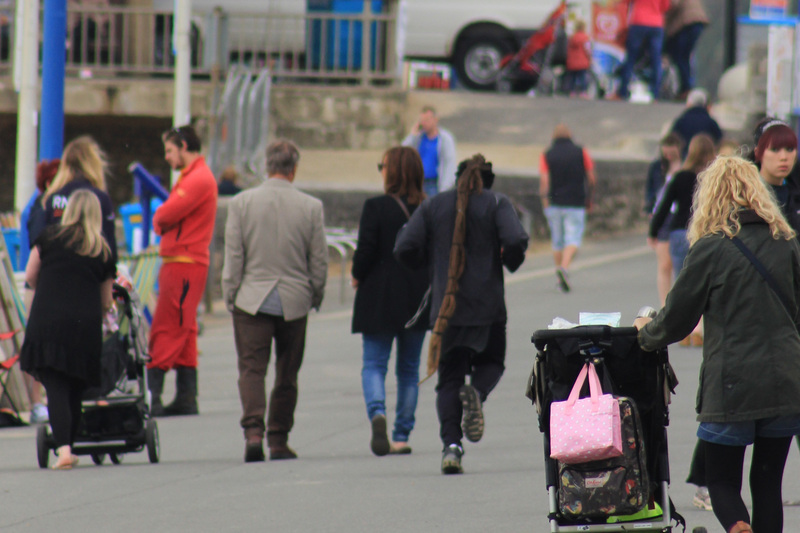 At one point the man with the longest hair I have ever seen (at least on our Coastal Path) bounded passed us. I reached for my camera but he was gone, racing through the people of Boscombe as if his hair gave him Samson-like strength. All I managed was a blurry afterthought of a photo (my autofocus was distracted by a pink polkadot bag). And then we were back at Boscombe Pier, where we finished our last walk. We were back on virgin territory. This entry was posted in Dorset and tagged Boscombe, coast, Dorset, goats, hair, walking. Bookmark the permalink. Walked this section one sunny September day nearly 3 years ago. Didn’t see any goats. Plenty of retired people and yummy mummies with pre-school tots. The main problem was sand, which had been bulldozed clear off the walkway but still lay about in huge drifts everywhere. I sure wouldn’t want to be on the business-end of those goat horns!